Vedantu.com - No.1 online tutoring company in India provides you Free PDF download of NCERT Solutions for Class 11 Chemistry Chapter 14 - Environmental Chemistry solved by Expert Teachers as per NCERT (CBSE) Book guidelines. 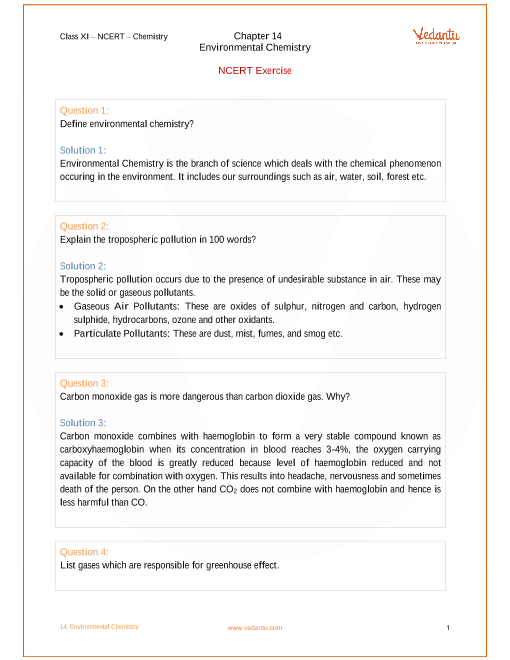 All Chapter 14 - Environmental Chemistry Exercise Questions with Solutions to help you to revise complete Syllabus and Score More marks. Register for online coaching for IIT JEE (Mains & Advanced), NEET, Engineering and Medical entrance exams. NCERT Grade 11 Chemistry Chapter 14, Environmental Chemistry deals with the study of the origin, transport, reactions, effects and fates of chemical species in the environment. Environmental studies deal with the sum of all social, economical, biological, physical and chemical interrelations with our surroundings. In this unit the focus will be on environmental chemistry. After studying this chapter, students will be able to understand the meaning of environmental chemistry; define atmospheric pollution, list reasons for global warming, greenhouse effect and acid rain; identify causes for ozone layer depletion and its effects; give reasons for water pollution and know about international standards for drinking water; describe causes of soil pollution; suggest and adopt strategies for control of environmental pollution; appreciate the importance of green chemistry in day to day life. With the help of this chapter, students will learn the concepts of Environmental Pollution, Atmospheric Pollution, Tropospheric Pollution, Stratospheric Pollution Formation and breakdown of Ozone, Water Pollution, Causes of Water Pollution, International Standards for Drinking Water, Soil Pollution, Pesticides, Industrial Waste, Strategies to Control Environmental Pollution, Waste Management, Green Chemistry and Green Chemistry in Day-To-Day Life. NCERT Grade 11 Chemistry Chapter 14, Environmental Chemistry is from Unit 14 that holds a weightage of 18 marks including Unit 12 and Unit 13 in the final examination. Get 100 percent accurate NCERT Solutions for Class 11 Chemistry Chapter 14 (Environmental Chemistry) solved by expert Chemistry teachers. We provide solutions for questions given in Class 11 Chemistry text-book as per CBSE Board guidelines from the latest NCERT book for Class 11 Chemistry. The topics and sub-topics in Chapter 14 Environmental Chemistry are given below. EX 14.7.2 - Green Chemistry in day-to-day Life. Chapter 14 - 20 Questions with Solutions. Other than given exercises, you should also practice all the solved examples given in the book to clear your concepts on Environmental Chemistry. Download the free PDF of Chapter 14 Environmental Chemistry and take the print out to keep it handy for your exam preparation.